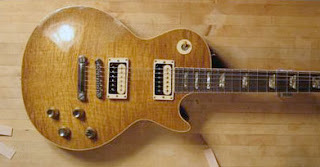 Gibson recently announced the soon to be released, limited run Slash signature 'Appetite' Les Paul. My guess is that this will be the most talked about, reviewed, discussed and dissected axe for 2010. But folks, 'Appetite' has got to be one of the strangest guitar model names ever. Not to mention that its imminent release comes so closely after Jimmy Page's 'Number 2'. Is it just me or are we seeing some kind of gastro-intestinal pattern developing here? Too bad that the far more elegant sounding 'AFD' has already been taken by Marshall for their new line of Slash amps. What is interesting is that Gibson, after taking several stabs at a Slash signature Les Paul over the years, has finally chosen to tackle head-on and attempt to replicate the guitar used on Appetite For Destruction. Never mind that the singing beast used by Slash on Guns N' Roses debut wasn't made by Gibson but was actually a Les Paul copy built by one Kris Derrig.